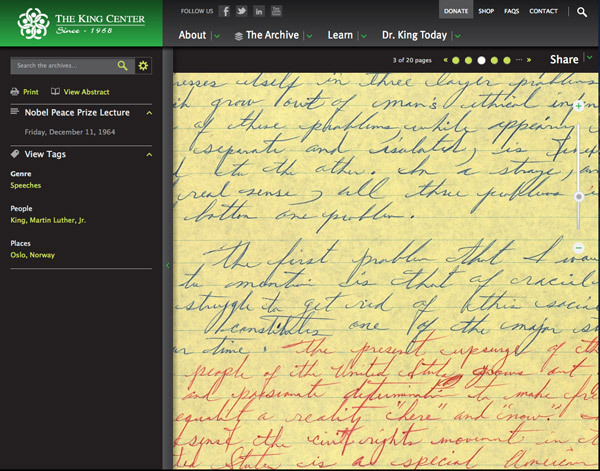 Fresh Project: Website for The King Center Imaging Project, an Initiative of JPMorgan Chase & Co. This Martin Luther King, Jr. Day is particularly special for C&G; Partners: a new website designed by the firm for The King Center in Atlanta , including never before seen artifacts from the King collection, was released to the public. 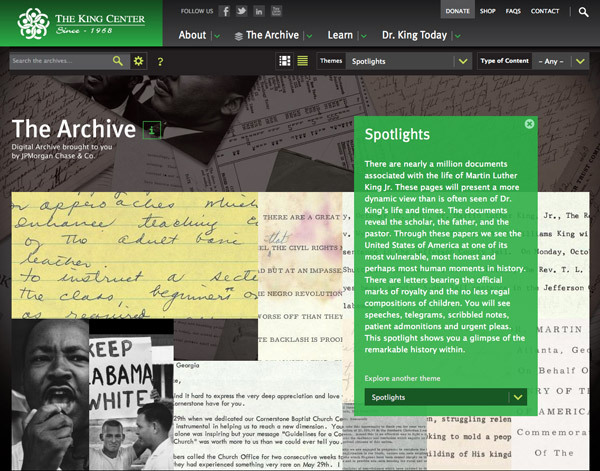 The King Center Imaging Project, an Initiative of JPMorgan Chase & Co., has created a new digital archive to be the basis of the new site. It makes thousands of documents – letters, speeches, drafts, notes, photos and more - available for free to the general public for the first time. The new site is designed to be used by people around the globe, particularly in the developing world.Led by partner Maya Kopytman , the new site builds on the graphic identity established for the project's related traveling exhibition , completed by the firm in 2011. The website’s digital archive was designed to inspire exploration and discovery through the introduction of randomly-displayed collection themes. To facilitate research and education, filters based on specially curated themes parse the collection for a more funneled experience. Advanced search gives expert users very specific query tools including location, date range, organizations and people, to name just a few. On archive detail pages, panning and zooming controls allows users to view the details of the document collection. Wear and tear on the paper, handwritten notes scribbled in margins, and the signature of Dr. King himself can all be seen in minute detail. Tags, related documents, transcripts and translations all contribute to a rich interaction with a continuously growing resource. The project is an Initiative of JPMorgan Chase's Technology for Social Good program. C&G; Partners worked in collaboration with Chicago-based web development firm Palantir . The site is built in Drupal 7. The archive is managed using the open source Alfresco platform, customized and implemented by Micro Strategies, Inc . Assets for the online digital archive are stored using AT&T;'s Synaptic Storage as a Service , powered by EMC's Atmos technology and hosted on Acquia’s Managed Cloud platform. The design of the imaging lab and the processes for capturing images were engineered by Scott Geffert of imagingetc . 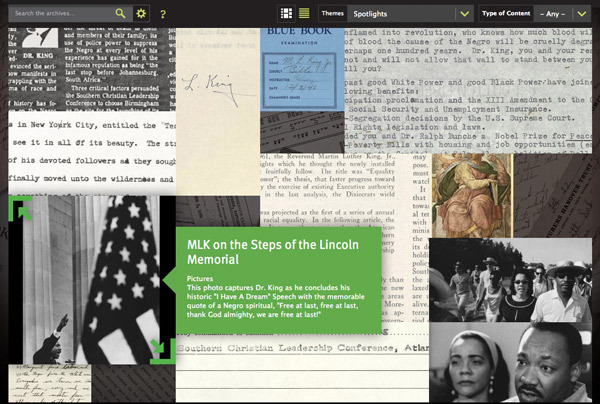 C&G; Partners is humbled and grateful to have been part of this project: not only to assist in offering millions of people a priceless resource at their fingertips, but to build increased awareness of Dr. King and his philosophy with a worldwide audience.